Washington: Using NASA’s Chandra X-ray Observatory, astronomers have found that the growth of galaxies containing supermassive black holes can be slowed down by a phenomenon referred to as cosmic precipitation. Cosmic precipitation is not a weather event, as we commonly associate the word -- rain, sleet, or snow. Rather, it is a mechanism that allows hot gas to produce showers of cool gas clouds that fall into a galaxy. Researchers have analyzed X-rays from more than 200 galaxy clusters, and believe that this gaseous precipitation is key to understanding how giant black holes affect the growth of galaxies. Astronomers have long pursued the quest to understand how supermassive black holes, which can be millions or even billions of times the mass of the sun, affect their host galaxies. The study looked at some of the largest known galaxies lying in the middle of galaxy clusters. These galaxies are embedded in enormous atmospheres of hot gas. This hot gas should cool and many stars should then form. However, observations show that something is hindering the star birth. The answer appears to lie with the supermassive black holes at the centers of the large galaxies. Under specific conditions, clumps of gas can radiate away their energy and form cool clouds that mix with surrounding hot gas. Some of these clouds form stars, but others rain onto the supermassive black hole, triggering jets of energetic particles that push against the falling gas and reheat it, preventing more stars from forming. This cycle of cooling and heating creates a feedback loop that regulates the growth of the galaxies. “We can say that a typical weather forecast for the center of a massive galaxy is this: cloudy with a chance of heat from a huge black hole,” said co-author Greg Bryan of Columbia University in New York. Voit and his colleagues used Chandra data to estimate how long it should take for the gas to cool at different distances from the black holes in the study. Using that information, they were able to accurately predict the “weather” around each of the black holes. They found that the precipitation feedback loop driven by energy produced by the black hole jets prevents the showers of cold clouds from getting too strong. The Chandra data indicate the regulation of this precipitation has been going on for the last 7 billion years or more. 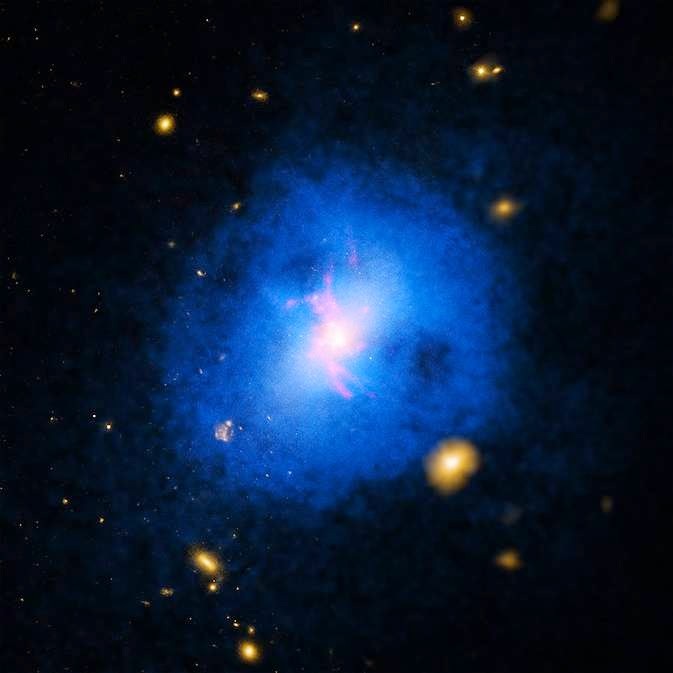 “Without these black holes and their jets, the central galaxies of galaxy clusters would have many more stars than they do today,” said co-author Michael McDonald of the Massachusetts Institute of Technology in Cambridge. Future studies will test whether this precipitation-black hole feedback process also regulates star formation in smaller galaxies, including our own Milky Way galaxy.